Cleaning up the environment is no walk in the park. But what if the problem could become part of the solution? Two Ohio University professors--one an engineer, the other an artist--teamed up to clean up the oozing, toxic sludge released by old coal mines with a sustainable strategy: turn the toxic sludge into beautiful, commercially sold paint, with profits directed towards stream remediation efforts. When heavy metals leach out of Ohio’s abandoned coal mines, the sulfide minerals acidify the water and turn streams into sites of slimy toxic sludge, killing fish and destroying ecosystems. Ohio University engineer Dr. Guy Riefler, whose research focuses on acid mine drainage, experimented with salvaging useable pigment from the mine runoff, which turns bright colors when exposed to oxygen. In order to discern “good” pigment from bad, he collaborated with John Sabraw, an artist and associate professor of art at Ohio University, blending the arts and sciences together to sustainably develop new types of paint. These paints are also safe to produce and use. Sabraw, who aims to use sustainable materials and methods in his artwork, has used these colorful pigments to create beautiful, organic forms in his paintings inspired by the natural landscape of trees, streams, and landscapes. Riefler and Sabraw’s ultimate goal is to bring their sustainable paints to market in a local, sustainably-sourced business venture that would fund cleanup for the polluted streams – and it may even create a few local jobs in the process. 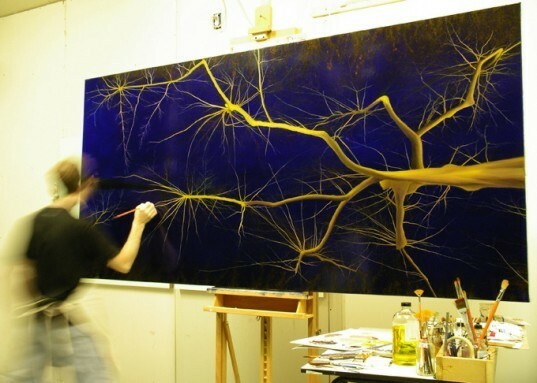 Artist John Sabraw in action using sustainable pigments extracted from acid drainage runoff. When heavy metals leach out of Ohio's abandoned coal mines, the sulfide minerals acidify the water and turn streams into sites of toxic slimy sludge, killing fish and destroying ecosystems. By taking metal-laden water samples from Ohio's damaged streams, Sabraw found that a rich range of colors can be extracted from the iron ore (ferrous oxide), "anything from a mustardy yellow all the way to an incredibly rich, deep, deep almost-black brown." John Sabraw's Chroma s1.1 captures the intensity of colors that can be derived from the sustainable pigments. John Sabraw swirls sustainable paints of yellow, red, purple and green together. 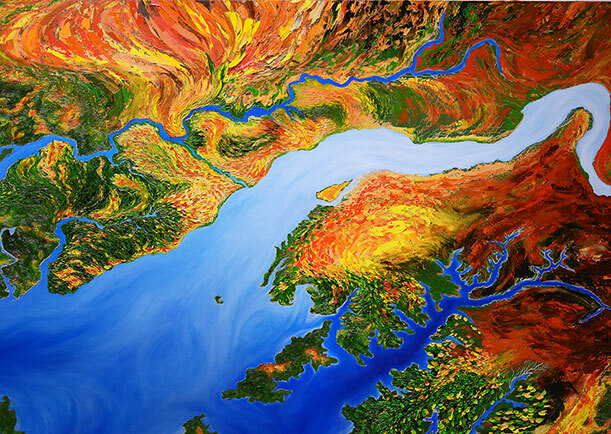 John Sabraw paints a landscape painting of an estuary on birch panel. Ebb, one in the series of Sabraw's Arborescent Show, shows an organic and florescent tree-like form contrasting against a bright purple background. 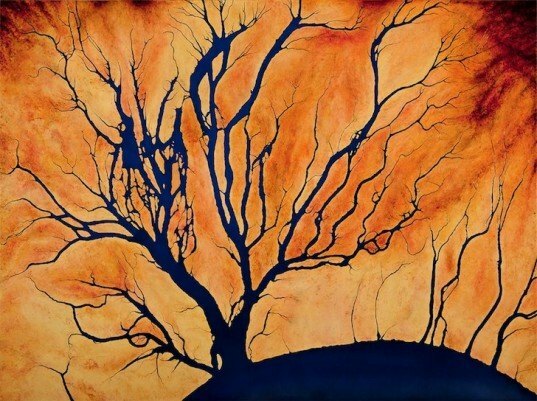 John Sabraw's Flow painting contrasts a silhouetted tree against a fiery orange background.